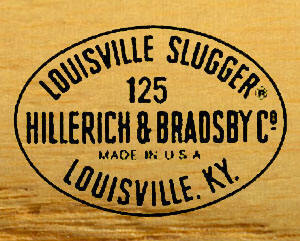 Hillerich & Bradsby Co. Louisville Slugger has used different oval center brands in their history. 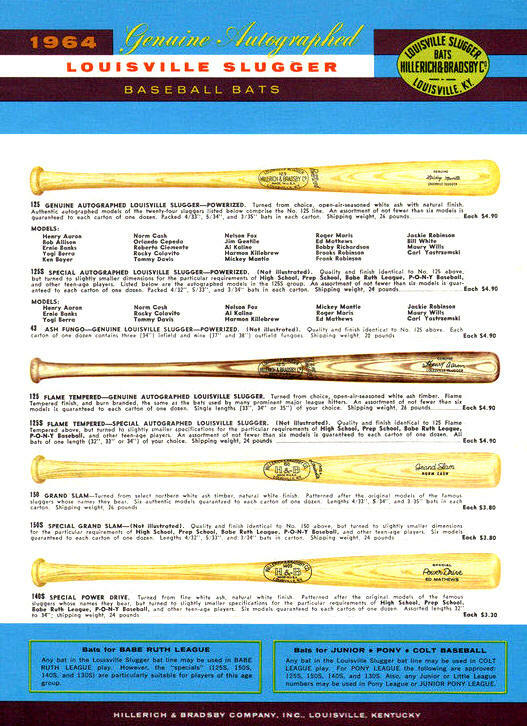 Below are the ovals from different eras for professional model, top of the line, and inexpensive store model bats. 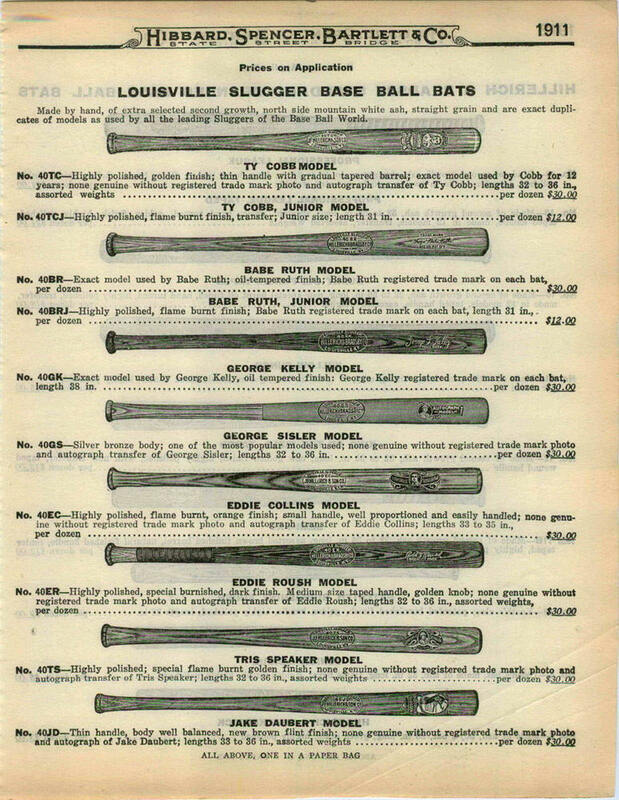 By matching the samples with the logo on your bat, you could approximately date your Louisville Slugger to that era.Variations in branding for 125 professional model bats could narrow down the years, as described by visiting the link provided. Outside and below the oval has the word "TRADEMARK" There is one example that uses the word "COPYRIGHTED"
The next center brand Reads: "J.F. 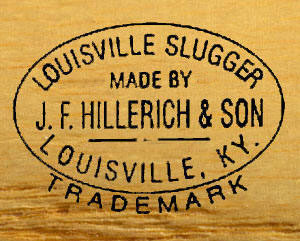 HILLERICH & SON" done with "MADE BY" above it, and "LOUISVILLE SLUGGER" at the very top. Below is a simple line with "LOUISVILLE, KY. " at the bottom. All branding has a new font from the previous label. Outside and below the oval has the word "TRADEMARK"
"C0." is added after "J.F. 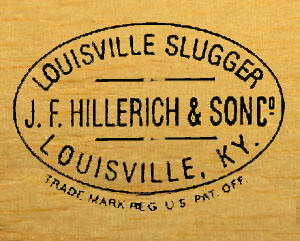 HILLERICH & SON" starting in 1911. Also nicknamed a "dash-dot dash" bat by collectors this center brand features the addition of "Co." and now reads "J.F. HILLERICH & SON Co." sandwiched between a pair of "dash-dot dash" lines. There is also a variation with "MADE BY" above "J.F. HILLERICH & SON Co." with the "dash-dot dash" below. "LOUISVILLE SLUGGER" is at the very top of the oval with "LOUISVILLE KY. at the bottom. Outside and below the oval reads: "TRADE MARK REG U.S. PAT. OFF." In 1916 Frank Bradsby joins the company and Bradsby is added to the company name. The oval mow reads: "HILLERICH & BRADSBY Co." with the catalog number directly above it. 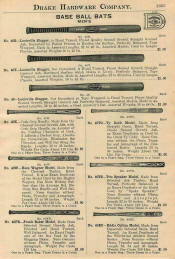 (pictured is catalog designation 125) "LOUISVILLE SLUGGER" is at the very top of the oval. "MADE IN U.S.A." replaced dash-dot-dash in 1921, and is directly below "HILLERICH & BRADSBY Co." with "LOUISVILLE KY. at the very bottom. "TRADE MARK REG U.S. PAT. OFF." The 1930-1947 Center Brand remains exactly the same from the period before but outside and below the oval is changed and now Reads: "TRADE MARK REG." Inside the oval reads: "HILLERICH & BRADSBY Co." with the catalog number directly above it. 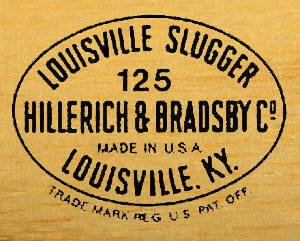 (pictured is catalog designation 125) "LOUISVILLE SLUGGER" is at the very top of the oval. 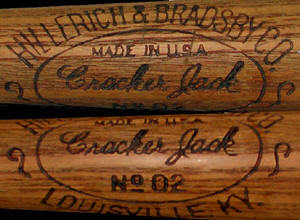 "MADE IN U.S.A." is directly below "HILLERICH & BRADSBY Co." with "LOUISVILLE KY. at the very bottom. The 1948-1964 Center Brand remains exactly the same from the period before but outside and below the oval is changed and now Reads: "REG. U.S. PAT. OFF." 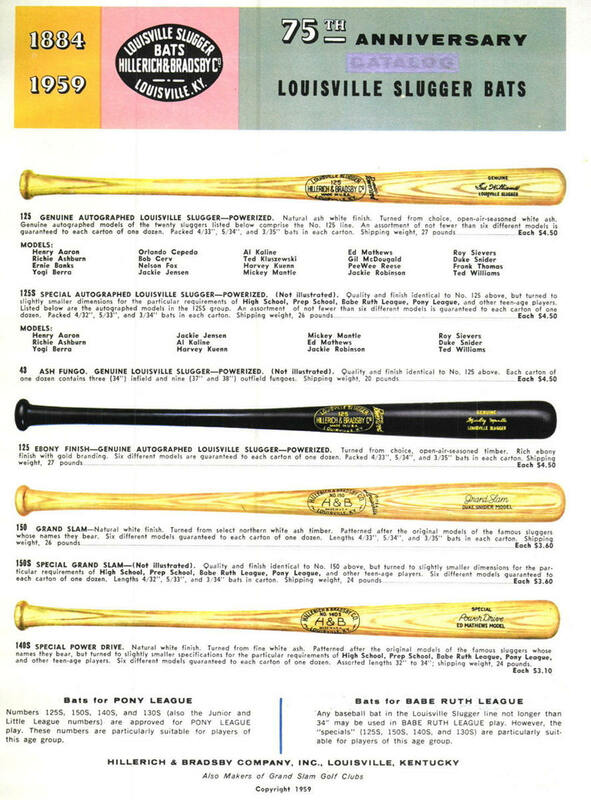 The 1965-1979 Center Brand remains exactly the same from the period before but the Registered Trademark is added directly after the words "LOUISVILLE SLUGGER" at the top. In 1973 the Registered Trademark is added over the "d" in Powerized (not shown here) Outside and below the oval "REG. U.S. PAT. OFF." is removed and left blank. The center reads: "HILLERICH & BRADSBY Co." with the catalog number directly above it. (pictured is catalog designation 125) "MADE IN U.S.A." is directly below "HILLERERICH & BRADSBY Co." with "LOUISVILLE KY. at the very bottom. The center brand goes through major changes in 1980. 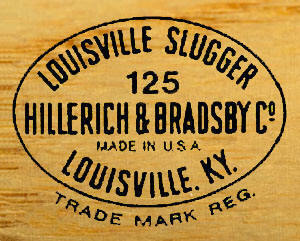 "HILLERICH & BRADSBY Co." is removed from the oval and is replaced with "Louisville, Slugger" with the Registered Trademark after the top of the lowercase "r" The catalog number is directly above at the top. (pictured is catalog designation 125) "LOUISVILLE, KENTUKY MADE IN USA" in small print is at the very bottom. There are other variations of this label through 2000-2015 but the sample is just showing the basic design of the oval. A breakdown of the different labels will be added soon. 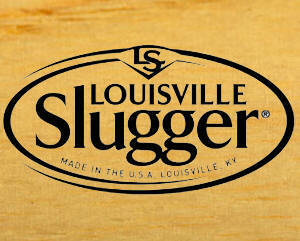 Thirty-three years since their last change, Louisville Slugger redesigns their logo. The closed oval is now open and elongated. The letters "LS" is squeezed in between the outer and inner boarders, at the top. 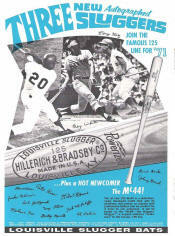 the Newly designed "LOISVILLE Slugger" logo dominates the oval with the the Registered Trademark after the top of the lowercase "r" Below at the very bottom reads: "MADE IN THE U.S.A. LOUISVILLE KY." in small print. 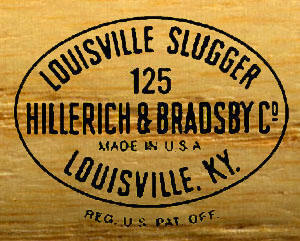 Some bats have an H&B logo brand in the oval trademark, rather than Hillerich & Bradsby - Louisville Slugger. 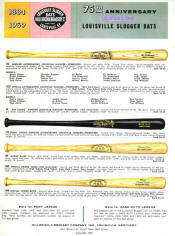 The H&B brand denotes a lower grade and lower priced retail bat. 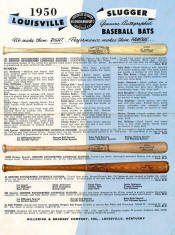 These bats were produced since 1932. The labels pictured below are dated to the first catalog appearance and could over lap the new label during the transition year .labels pictured below are dated to the first catalog appearance and could over lap the new label during the transition year. labels pictured below are dated to the first catalog appearance and could over lap the new label during the transition year. Before the H&B logo label, the name of the model appeared in the center oval, with the catalog number below, and "MADE IN U.S.A." above. "HILLERERICH & BRADSBY CO" appeared outside the oval at the top, "LOUISVILLE K.Y. outside the oval at the bottom. The oval was sandwiched between two question mark like (one inverted) ornate designs. The sample shown is the "Cracker Jack" No. 02. Other models with this oval design included the "Safe Hit" and "Junior League" models. The earlier bats features a decal on the barrel. The "H&B" Logo center brand first appears in catalogs in 1932. Inside the oval reads: "HILLERERICH & BRADSBY CO." at the top; "MADE IN U.S.A. " above "H&B" followed by the catalog number, below. (pictured is "NO. 9") and "LOUISVILLE K.Y." at the bottom sandwiched between "f'" like ornate designs. This H&B logo center brand is identical to the previous label but the catalog number is now above "H&B". Inside the oval reads: "HILLERERICH & BRADSBY CO." at the top; the catalog number above "H&B" followed by "MADE IN U.S.A. " below, and "LOUISVILLE K.Y." at the bottom sandwiched between "f'" like ornate designs. The "H&B" Logo is redesigned from a simple line to a block type font. The "NO." that appeared before the catalog number is no longer used. The "f'" like ornate design is also removed. Otherwise the information in the oval remains the same. "HILLERERICH & BRADSBY CO." at the top ;the catalog number above "H&B" followed by "MADE IN U.S.A. " below. and "LOUISVILLE K.Y." at the bottom. This H&B logo center brand is identical to the previous label but the Registered Trademark symbol is added to the right of the "H&B" logo. HILLERERICH & BRADSBY CO." is at the top; the catalog number above "H&B" followed by "MADE IN U.S.A. " below, and "LOUISVILLE K.Y." at the bottom. The "H&B" Logo and oval is redesigned . HILLERERICH & BRADSBY CO. is removed from the top and is replace with the catalog No. The ampersand (&) is lowered and halfway below the "H" and "B" witch is also brought closer together. The Registered Trademark symbol is to the right of the H&B logo but now at the top. "LOUISVILLE SLUGGER" is at the bottom to the left of the ampersand, & "MADE IN U.S.A." to the right. What Does the 125 stand for? 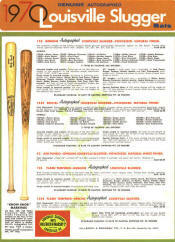 - The number that appears in the center brand is the catalog number, used to order bats. 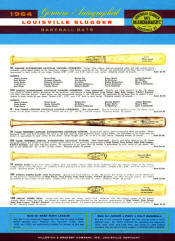 The "125" is the catalog number designated for Professional and high quality store model bats. The highest grade of wood is reserved for all 125 baseball bats. Before the 125 the No. 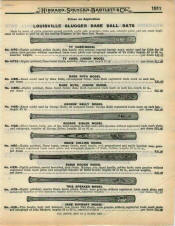 40 was the highest quality line of baseball bats in the Louisville Slugger catalog. The 125 is not the model number. 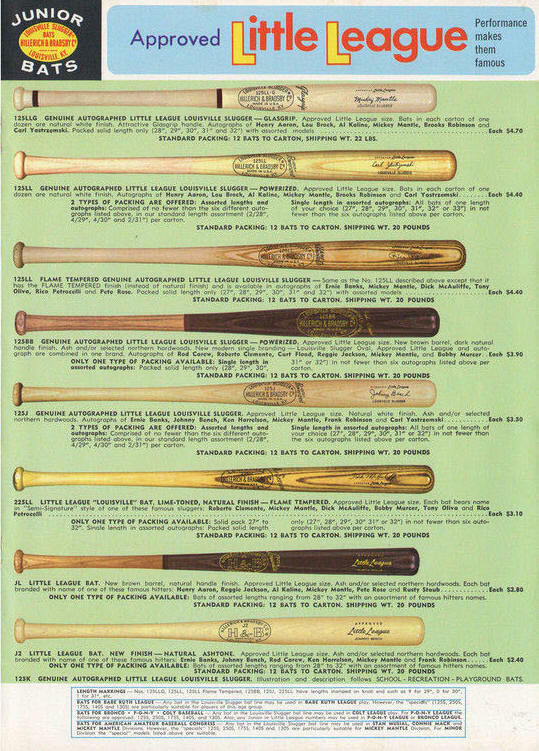 Louisville slugger began using model numbers on the knob in 1943 then moving the model number to the barrel in 1977. The "Powerized" process was patented by the Hillerich & Bradsby Co. in 1931 and has pat. pending beneath the stamp. They introduced the "Powerized and Bone Rubbed" logo for the 1932 season and in 1933 and 1934 you will see it stamped "Powerized and Oil Tempered" which usually is a very light heat foil type print. 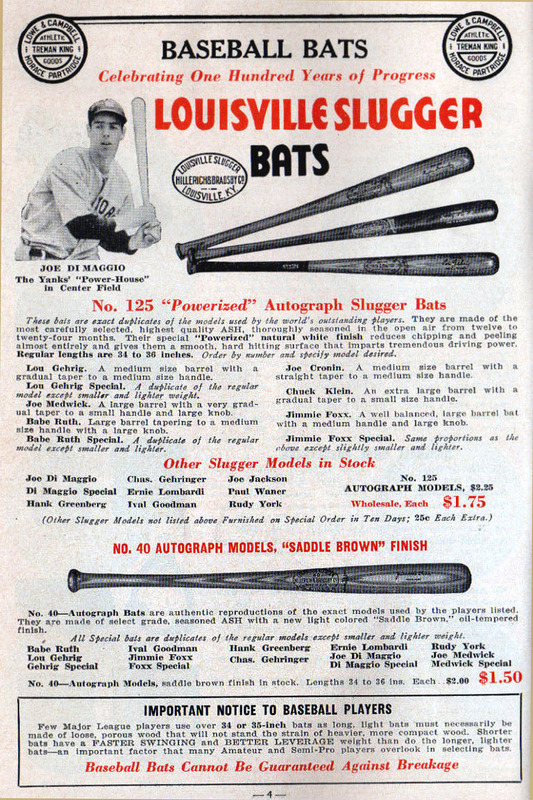 Beginning in 1935 until present, they go with just "Powerized" The Powerized" process is to harden the surface of the bat much like the bone rubbed finish of the 1920's. A 1938 Louisville Slugger ad states: "'Powerizing' is a treatment by a special patented process that reduces chipping and peeling to a minimum, increasing the driving of the bat and prolongs it's life"
Hand Boned Rubbed Trade-Mark Stamp. Bone-Rubbed is common to bats made in the 1920's "Bone-Rubbed which closes pores of wood and gives a harder hitting surface." 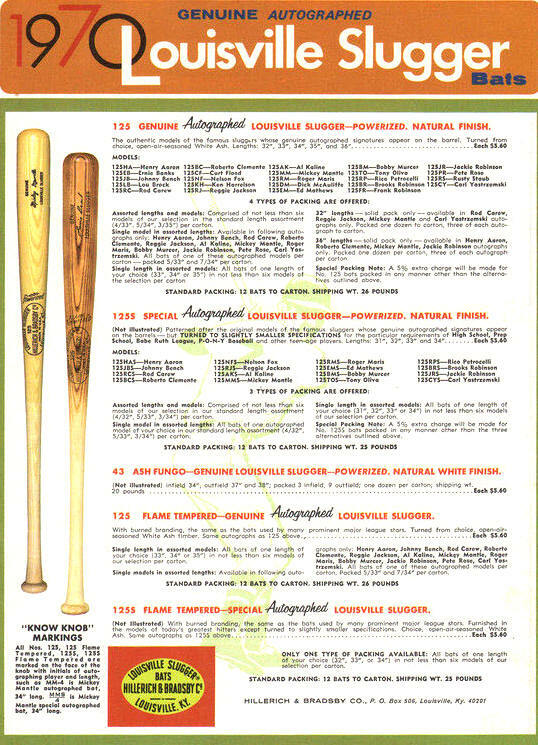 1934 H&B Catalog The "Powerized and Bone Rubbed" logo stamping is unique to the 1932 season. 1933 & 1934 "Powerized and Oil Tempered" is stamped, usually as a very light heat foil type print. 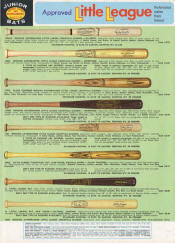 In 1935 until the present, they go with just "Powerized" In 1973 the Registered Trademark is added over the "d" in Powerized Oil Tempered a process used since the beginning appeared on the barrel before migrating to the oval Flame Tempered a process of drying and hardening the wood with lower grade baseball bats. 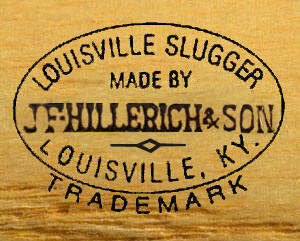 1884 Bud Hillerich turns the first Louisville Slugger bat ever made. 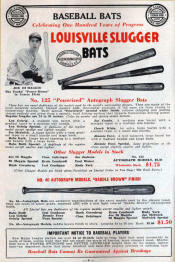 1905 Honus Wagner signs a contract making him the first player to have his autograph on Louisville Slugger bats. 1911 The company name is changed to “J.F. Hillerich & Son Co.” . 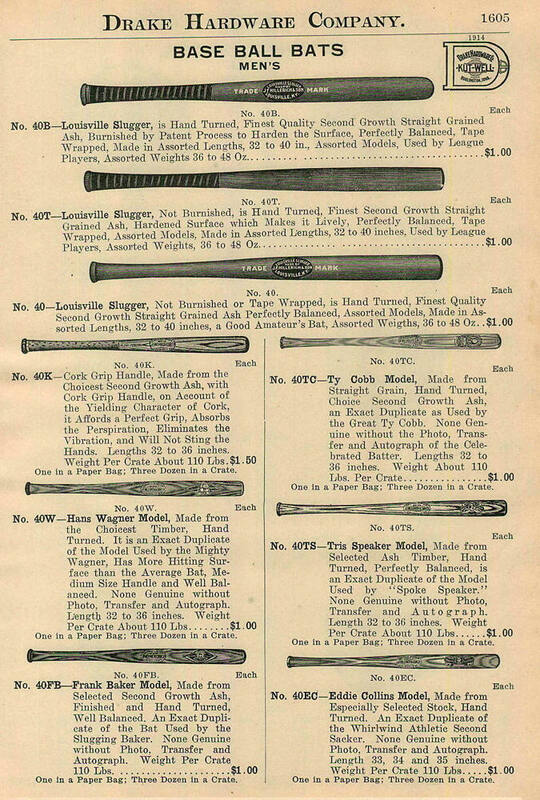 1916 Hillerich & Bradsby introduces the "125" line of Baseball bat to the market. 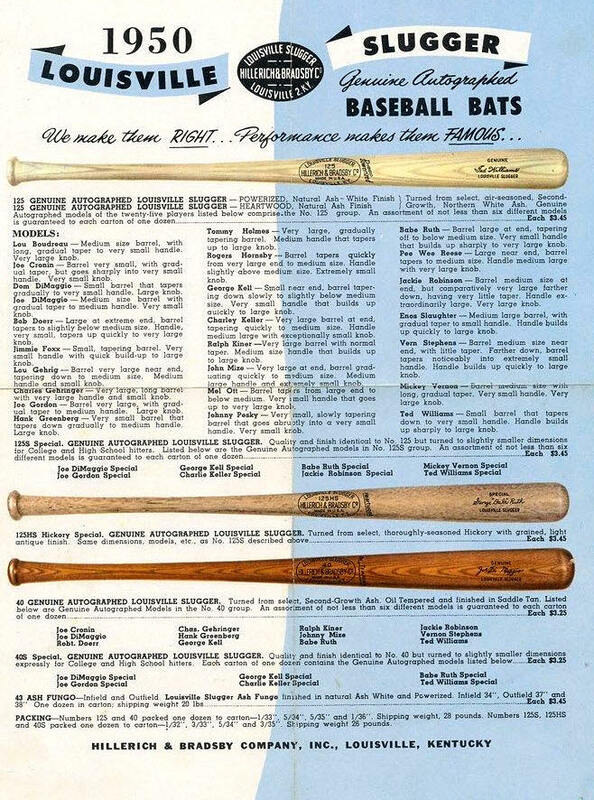 1931 The patent is granted for "Powerized" a process that "reduces chipping and pealing"
1970 H&B contracts Alcoa Aluminum Company to manufacture the first aluminum bat for Louisville Slugger. 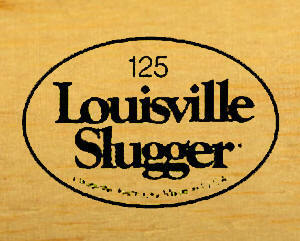 2013 Thirty-three years since their last change, Louisville Slugger redesigns their logo. 2014 Never done in its 130 year history, Louisville Slugger retires Derek Jeter’s famous P72 Baseball bat. 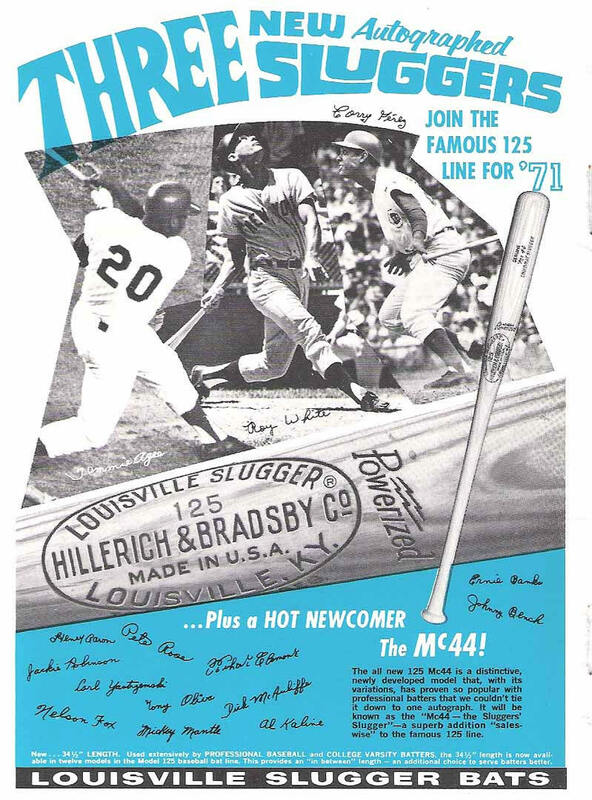 2016 Wilson Sporting Goods acquires the Louisville Slugger brand from Hillerich & Bradsby Co.